“Ben is Back” starts out well-intentioned enough, but by the end it comes off as a hyper-exploitive freak out. The movie, a day in the life of the Burns’ family, tackles the dire issue of opioids from several different angles. Sometimes it tackles it in very realistic terms, specifically the pain and awkwardness it can create for families in its wake. However, it predominantly tackles it like a daytime soap opera, with the gauche touch of those 80’s drug PSAs. Ben (Hedges) has unexpectedly returned home on Christmas Eve. His younger siblings, who have no memory of the terrifying nights he put his family through, are happy to see him; His sister and mother not so much. Holly (Roberts), Ben’s mom, immediately goes to work hiding drugs that could trigger her son’s addiction, as well as jewelry and other sellable knick knacks, just in case he’s already relapsed. It’s in these opening moments that the film is emotionally riveting by not holding back on any of its emotional gut punches. Then it starts going off the rails when Holly confronts Ben’s old doctor at the mall and tells him that she hopes he rots in Hell. Merry Christmas from the Burns family! To dive into the specifics of why “Ben is Back” continues to fall off the wagon, and hard, would be to ruin the film’s second act, which feels more like another movie with the same actors was flipped on in the projector booth. What should have been a harrowing story about addiction, becomes an even more over-the-top “August: Osage County,” involving drugs and crime. There are also several moments where I can just hear Nancy Reagan bemoaning the horrors of addiction and paralyzing viewers with fear that we too can suffer every feasible scenario from just one night of drug use. It’s not that the things that happen to and around Ben, haven’t happened before or could happen to an addict and their families, but it’s the frequency, severity, and occurrence of which it happens in “Ben is Back” that’s laughable. I half expected Walter White of “Breaking Bad” to pop-up and tell Ben to stay out of his territory. That’s how comically bad it gets. Because of the dire subject matter though, it takes a veteran actor or two to wring out any semblance of seriousness in the script. No matter how bad the dialogue gets, Roberts and Hedges tow a fine line to keep their characters within the realm of “maybe this could happen.” It’s actually quite impressive seeing Hedges go toe-to-toe with Roberts when they argue or clash. I couldn’t imagine anyone else, in either role, pulling off the same acting acrobatics and making it remotely watchable. In that regard, “Ben is Back” is admirable in its dramatic attempts. Like I said, it’s well intentioned and the first 30 to 40 minutes are good, but sometimes the best of intentions can hurt the cause you’re reportedly fighting for. I’m not sure who this movie is for. Sometimes coming-of-age films ring true for everyone because it speaks specifically to those who lived the generation it represents and still manages to slip in some universal truths. 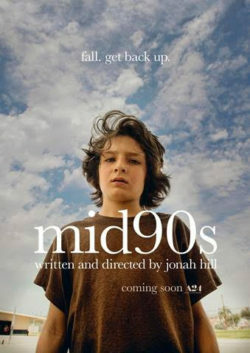 “Mid90s” seems specifically niche: stoner skateboarders who grew up on “Ren and Stimpy” cartoons and played NES video games. It’s not necessarily a bad thing because the film manages to stretch outside those confines, painting a broad picture of children who’ve come from single parent homes or troubled living conditions. You just have to squint a little hard to see it. The film focuses on 13-year-old Stevie (Suljic), who actually looks a lot more like he’s 10. He seems to take daily beatings from his older brother, Ian (Hedges), who’s just turned 18. Their single mother, Dabney (Waterston), loves them unconditionally, but seems to have taken a hands-off approach during their pubescent years. Ian and Dabney become background noise in Stevie’s life when he’s accepted into a group of rebellious young boys hanging out at a skateboard shop. This misanthropic brotherhood doesn’t seem to have much in common, but the glue that binds them is their status as outcasts at home, school and in life. The alpha dog of the group, Ray (Na-Kel Smith), also manages to keep them all in line, even when they’re at each other’s throats. “Mid90s” is the kind of movie “Lords of Dogtown” wishes it was, even though the target audience might fight me on that unpopular opinion. “Mid90s” prevents itself from being overly dramatic and unrealistic thanks to Hill’s raw script which highlights the politically incorrect vernacular of the time while unflinching capturing troubled youth in Los Angeles. However, there are a lot of gaping flaws in how everything is presented. The comedy sprinkled throughout sometimes works, but also undercuts the seriousness of several situations. It also may not be funny for those uncomfortable with how carefree some slurs were used by teens in the 90s. There’s also one scene in particular that quickly goes from uncomfortable to borderline exploitive. There are flashes of creativity with Hill’s directorial debut, but too often he limits his characters and the stories they have to tell. There’s an inventive subtleness to what Hill reveals about Stevie and his crew, but too often we’re left with more questions than answers. The scope is so narrow that the average moviegoer may find “Mid90s” to be too brash and at times, a bit derivative. But underneath its crass nature, are good-intentions and a unique perspective on growing up that we’ve rarely seen. Lee Chandler (Affleck) is the kind of man who just likes to go about his business. The maintenance man for a group of apartment buildings, his days are spent shoveling snow, fixing leaks and helping tenants unclog their toilets. He doesn’t say much, taking in the world with sad eyes. But when his brother suddenly dies, Lee is forced to not only deal with the fallout from that tragedy but another one from his past as well. Featuring award-worthy performances from its three leads, “Manchester by the Sea,” is the perfect drama to off-set a multiplex full of Bad Santas and Dwayne Johnson. Lee’s brother, Joe (Kyle Chandler) has died and Lee must return to his old hometown to attend to things. While there he visits his nephew (Hedges) at his ice hockey practice. Several of the players gossip about Uncle Lee, though one maintains that “it never happened.” As the film progresses, we see Lee dealing with being charged with raising his nephew at the same time having to relive some of his past. The story is told seamlessly by writer/director Lonergan, with modern day easily blending into the past, slowly building up to why everyone in this small town appears to know of Lee. Affleck has steadily grown from the young tag along in “Good Will Hunting” to an actor of great range. His eyes often saying what he won’t with his mouth, Lee’s simple life is anything but simple. As Lee’s former wife, Michelle Williams bares her emotions in a performance sure to break your heart. As the young nephew suddenly left father-less, Hedges equally impresses. All three actors are sure to draw some serious consideration come awards season, as will the film itself. Easily one of the years best!